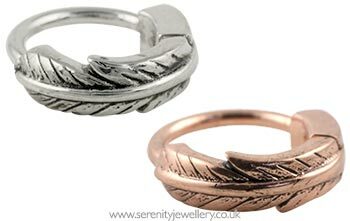 Sterling silver feather design (with or without rose gold plating) on a surgical steel hinged hoop earring for helix (upper ear) piercings. The feather design is 2.5mm thick and 3mm deep. Love this rose gold hoop. My granddaughter very envious. Will get her one for her birthday. Exactly what I wanted. Easy to clasp too. Really pretty but solid and good quality. Easy clasp. I really love this piece, I wanted something a little different to an average hoop and this was perfect especially since hinges are so much easier to close. Only reason I haven't given this 5 stars is because I wanted to use it for my helix and it is actually a tiny bit too small to sit comfortably around my ear but I still have worn it and love it just not for all the time everyday wear.